Sink your fork into this delicate flounder fillet topped with garlic herb butter, and discover the warm treasure of seafood stuffing within. Satisfy the soul and all of your seafood cravings with this delectable medley of the sea. 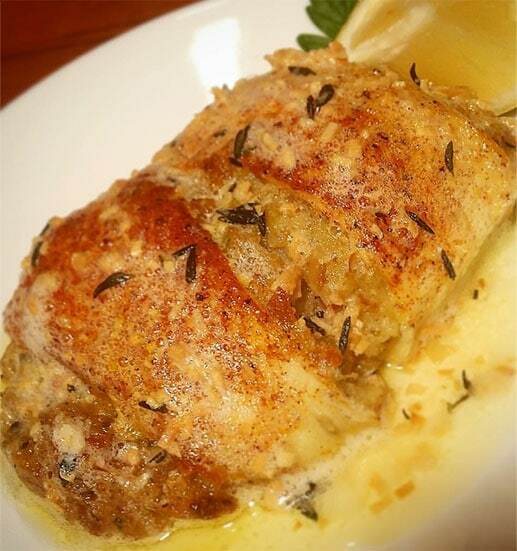 A perfectly trimmed yellowtail flounder fillet is wrapped around our made from scratch clam stuffing. The flounder is light, flakey, and mild, leaving room for the vegetable, clam, and brine of the stuffing to compliment one another. As the stuffing rises while the duo bakes, the delicate yellowtail flounder splits in the center revealing a most enticing presentation of the meal ahead. To finish, a pat of garlic herb butter is placed on top and allowed melt to the bottom edges of the pan. If you thought this would be easy, you are right again!